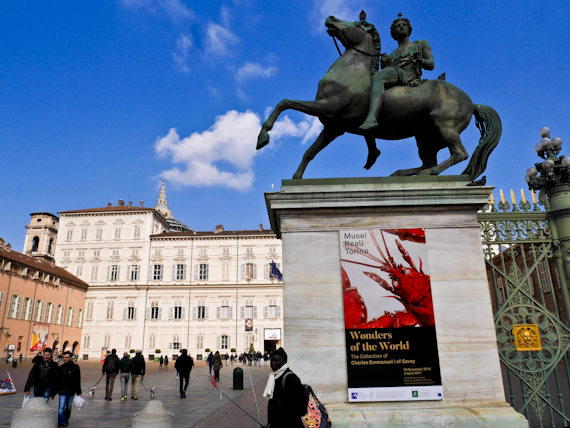 Turin is the capital of Piedmont in northern Italy, and the Alps rise up northwest of the city. To the south are the rolling green hills of the Langhe and Monferrato, Piedmont’s wine area, and the fertile Po valley is right on the doorstep. 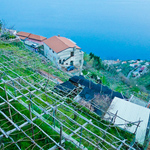 This varied landscape, coupled with different climates, means that there’s a wide range of produce available and the cuisines of neighbouring Liguria and France both influence Turin’s gastronomy. This was also a Royal City, as it was the capital of the Duchy of Savoy and then Italy for the first few years after unification. Lavish banqueting was a feature of court life and dining was an international affair with both Spain and Sardinia playing apart. 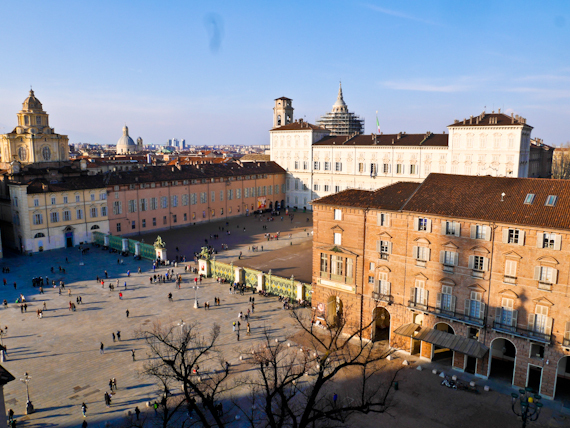 In recent years, Turin has been major player in the Slow Food movement, founded in 1986 in Italy and their twice yearly conferences, the Salone del Gusto and Terra Madre take place every two years in the city. 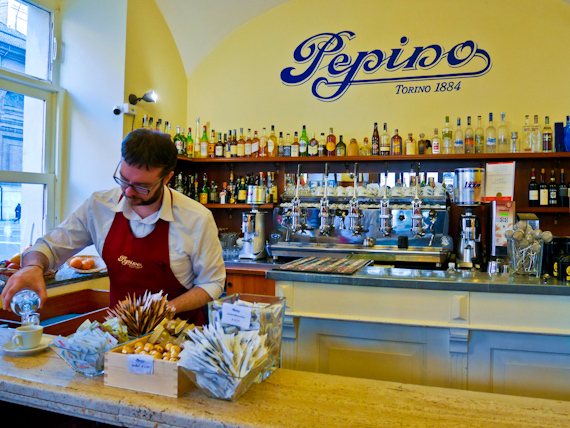 Gelateria Pepino was founded in 1884 by an ice cream maker from Naples but the present shop dates from 1929 and has been in the same family ever since. The grandfather of the present owner, Edoardo Cavagnino, came up with the idea of putting gelato on a stick in 1935 but it was sloppy and difficult to eat. He solved the problem by coating it with chocolate to keep it cool and the first Pinguino or Penguin went on sale in 1939. It originally sold for one Italian Lira, the price of a cinema ticket, and claims to be the world’s first choc ice. Of course it was a tremendous success and they are still making it today in five different flavours. Turin is Italy’s capital of the aperitivo, early evening drinks, and originated world famous brands like Martini Rosso, Cinzano and Gancia. It’s a custom that started around 200 years ago, and there’s always a buffet with local specialities to stave off any hunger pangs. Some of these are so lavish that they can be a cheap way of eating dinner, but be aware that the food is usually finished by 9 am. Caffe Roberto has gone one step further and created “Apericena”, served between 6 and 9.30 pm. 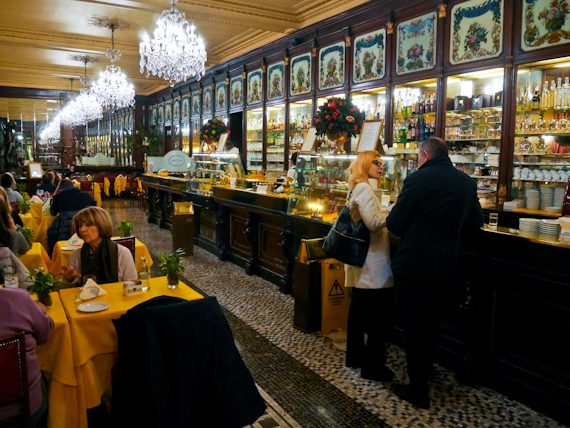 Placido Domingo is a regular here and it’s not difficult to imagine him gorging on the immense plates of pastas, risottos,and charcuterie to say nothing of the delicious desserts.10€ buys you a drink and all you can eat. Via Po, 5, 10124 Turin. 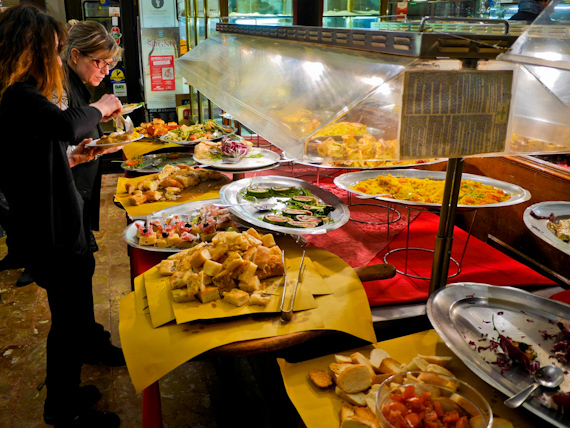 Porto di Savona is one the city’s oldest restaurants, opening in 1863 and still serving typical Torino fare. Start with a selection of appetisers which usually includes Vitello Tonnato, cold thinly sliced veal covered with a cream sauce flavoured with tuna. There are also grilled peppers served with Bagna Cauda, a hot sauce made of anchovies, garlic and olive oil and, strange to say, Russian salad, featured on almost every menu. Follow it with Agnolotti, a typical local ravioli stuffed with mince lamb. Make sure you have room for Fritto Misto alla Piemontese – a selection of battered meats deep fried and served with a squeeze of lemon. Wash it all down with Barbera local red wine. 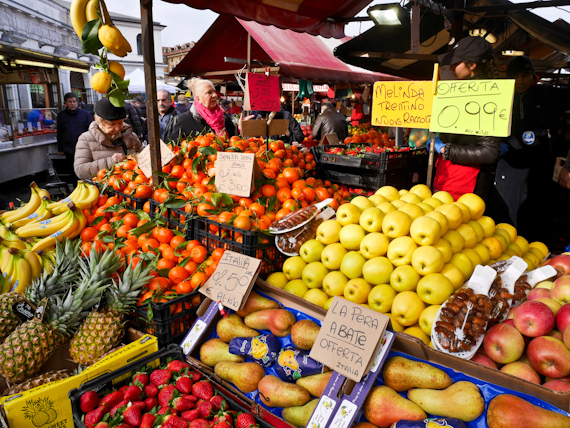 If you really want to get an idea of the quality of the region’s produce, then you won’t be disappointed at the Porta Palazzo Market, located in Piazza della Repubblica. With over 800 stalls, it’s one of the largest open air markets in Europe and is open Monday to Saturday. 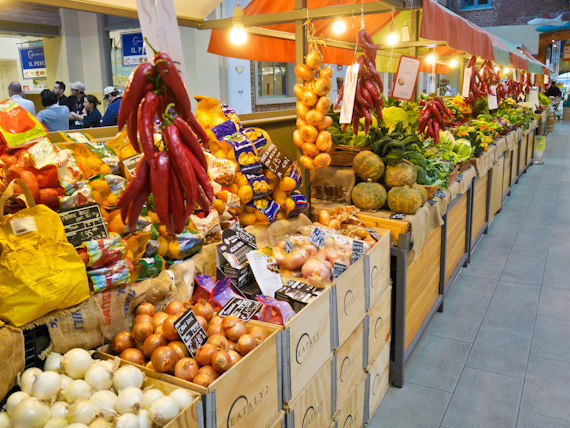 There are also three market halls dedicated to fish, meat, cheese and bread and a farmers’ market with around 100 stalls selling fresh produce. For a market of a different kind, it’s worth taking the metro to the Lingotto district where a disused Vermouth factory opened as an extraordinary food hall in 2007. Eataly now has branches all over the world and the concept is part supermarket, part farmer’s market and part wine cellar. They seem to choose the best local ingredients and there’s a whole section devoted to Slow Food. It’s not just a shop as it’s littered with restaurants and cafes, in various parts of the building serving dishes of the day at reasonable prices. 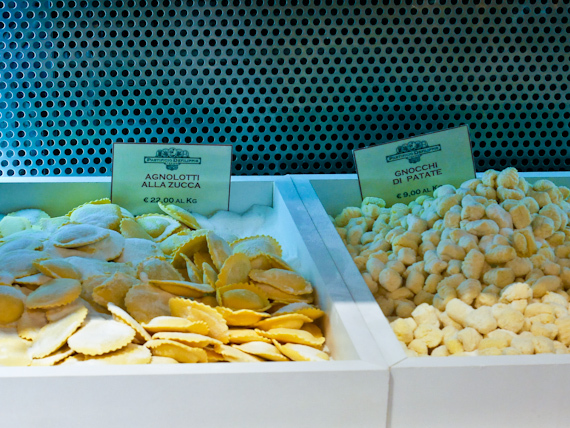 Located on the city’s most stylist street, Pastificio Defilippis is a pasta shop that has been here since 1872 and offers every shape and size imaginable. The Defilippis took over in 1940’s and upstairs is a pleasant restaurant. 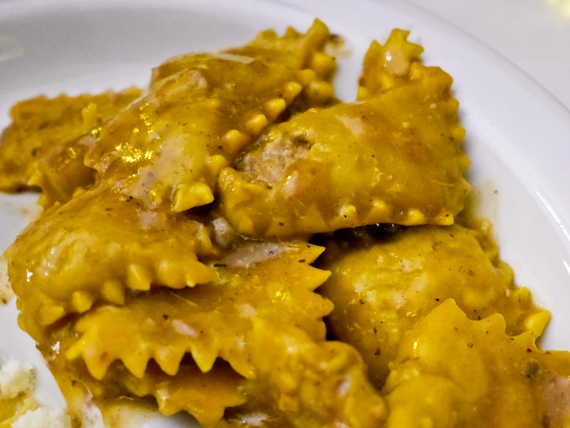 You have to sample their Agnolotti dal Plin which are said to have been invented during a Piedmont siege. The only food available were cold roast meats so they were ground with vegetables and stuffed into these small ravioli. They’re usually served in a beef broth and are rarely found outside the region. Another delicacy here are Gnocchi made with beetroot. At weekends, in the café of the Palazzo Reale, one of the Royal Palaces, you can celebrate an 18th century court ritual, devised after cocoa beans arrived in Piedmont. It’s a version of afternoon tea, but the beverage is thick hot chocolate and you’re served a selection of sweet biscuits, known as “bagnati” which you dunk in the drink. Many of them were specially created for the purpose and bear exotic names like Garibaldi, Parisien, Chifel, Democratic and Biciolan. If you crave an immediate sugar rush, Merenda Reale is for you. Saluzzo is a beautiful medieval town and this restaurant, in the vaults a former monastery, is well worth a visit. 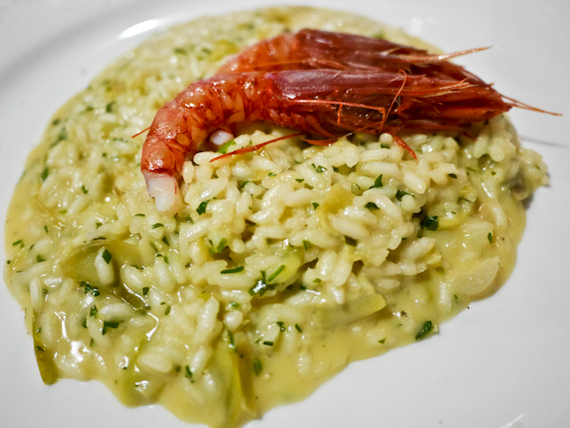 Cooking here is sophisticated – try their risotto with Sicilian prawns and artichokes. 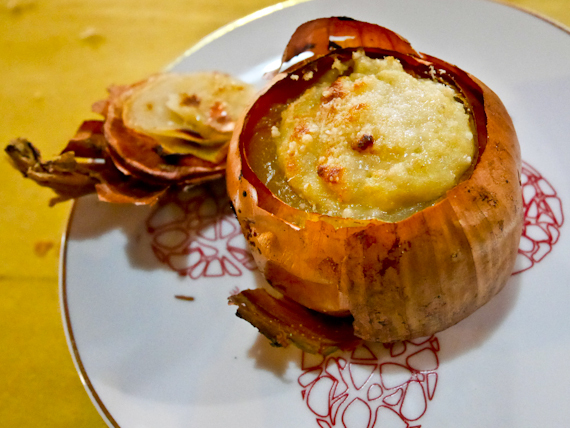 Follow it with veal, topped with a layer of local Castelmagno cheese. 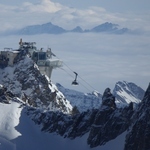 You might want to stay in one of their few rooms, as the copious quantities they serve make if difficult to move afterwards. Their Russian salad is the best in the region, baked onions stuffed with cheese, pumpkin risotto and pigs’ cheeks are just some of the dishes you might get served from their good value set menu. Apparently, in 1954, Ernest Hemingway made a detour here to buy some Cuneese al Rhum, meringues covered in chocolate with a rum flavoured cream filling. 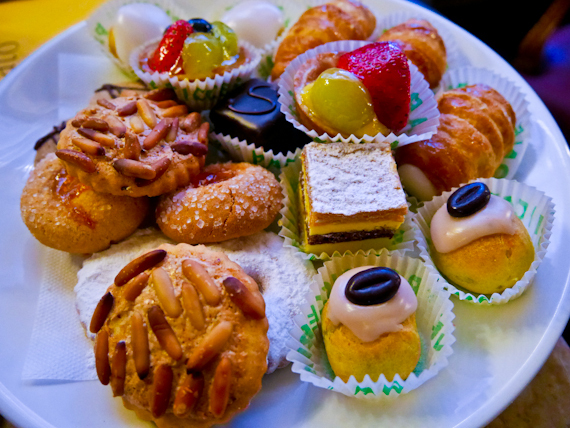 The café owns the rights to the name, but serves a whole range of delicious pastries and cakes. Grand Hotel Sitea is right in the centre of Turin. Prices for a double room and breakfast start from £129. 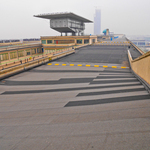 The Hotel NH Torino Lingotto Congress is in a converted Fiat factory, serves excellent food and is handy for Eataly. Prices are around £120 pp per night including breakfast. Hotel Antiche Mura is in the medieval centre of Saluzzo. Prices for a double room and breakfast start from £56. L’Antica Meridiana Relais-Art, is handy for Cuneo and is full of the owner’s art works.